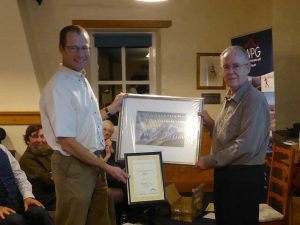 Many of Britain’s top outdoor writers and photographers gathered for the Outdoor Writers and Photographers Guild (OWPG) Annual Awards ceremony which took place on Saturday 14th October at Newlands Adventure Centre, Cumbria. Awarded by a vote of the OWPG membership. Richard Fox is responsible for the day-to-day repair and maintenance of the Lake District upland paths through Fix the Fells. Over the last 18 years he has directed the repair of over 250 paths. This includes sourcing stone from as close to the work sites as possible, arranging helicopter lifts, working on the specifications and landscaping requirements, and being responsible for quality assurance. 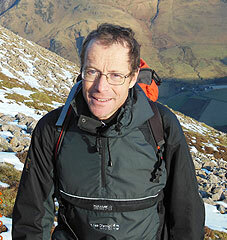 In this context Richard manages one of the most successful volunteer programmes in the Lake District. The ‘Lengthsmen’ scheme undertakes the vast majority of the maintenance work – nearly 2000 volunteer days each year – freeing the National Trust and National Park rangers to focus on larger project work. Richard has shared his knowledge with path workers in Scotland, Wales, Ireland and beyond. Without Richard, the massively popular paths of the Lake District would be in a much worse state of repair and the fells would be scarred with human erosion. His work also helps improve the water quality of the streams, becks, tarns and lakes by reducing the soil washing into water network. The Guild is entirely funded by its members and the kind support of ViewRanger, Aquapac International, OS Pathfinder Guides, Cicerone Publishing, Cordee, Conway (Bloomsbury Publishing).